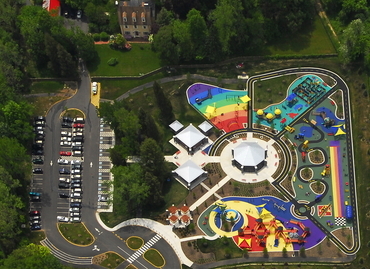 Clemyjontri Park features a unique playground where children of all abilities can play side-by-side. It is a playground where every child is welcome. This park is a place where children who use wheelchairs, walkers or braces, or who have sensory or developmental disabilities, can have a parallel playground experience of fun and exploration. The two-acre playground consists of 4 Outdoor "Rooms" surrounding a centerpiece carousel, as well as a large covered picnic area and restrooms.